When you say "yes" to everything, it's often to your own detriment. Saying "no" is not only OK, it is often the healthier choice. There are so many times where I have said “yes” when what I really wanted to say was “no”. Even when my gut is telling me to say “no”, somehow the fear of disappointing someone or feeling as if I can’t say “no” takes over. I know I’m not alone in this. One thing starting my own business has taught me is that saying “yes” all the time can be a detriment. Don’t get me wrong, sometimes saying “yes” to things that make you a little uncomfortable is a good thing. For example, if you get uncomfortable speaking in public and someone asks you to join a panel or take part in an interview. This is where saying yes even if you’re uncomfortable can push you to grow and perhaps lead you to bigger things. It’s important to recognize those opportunities vs. saying yes because you feel you have to. When I first started my business, I felt like I couldn’t say no to taking on certain clients. Who was I to turn away a potential paying customer when I was trying to grow revenue? What it really led me to do was take on clients that I wasn’t thrilled to be working with, who tended to creep up their scope of work without paying more and in turn, were eating up time where I could have been out getting the clients I really wanted. Even though it may feel hard in the moment, it’s important to evaluate the long-term effects of saying yes, when your gut tells you to say no. Sometimes that short-term payment isn’t worth it in the long-haul. In your personal life, saying yes to a date you’re not really sure about or a favor that you don’t have time for, are two examples where saying “no” would be a much healthier choice. For example, I was in a very toxic relationship for many years because I was continually saying yes, when I should have been saying no. By ignoring my gut, all I was doing was allowing someone to lie, manipulate and gaslight me. It had a huge impact on my life for a good amount of time afterward and it could have been avoided by saying “no” when I wanted to. While there’s no point in getting stuck on “what ifs”, it is important to carry the lesson with you. 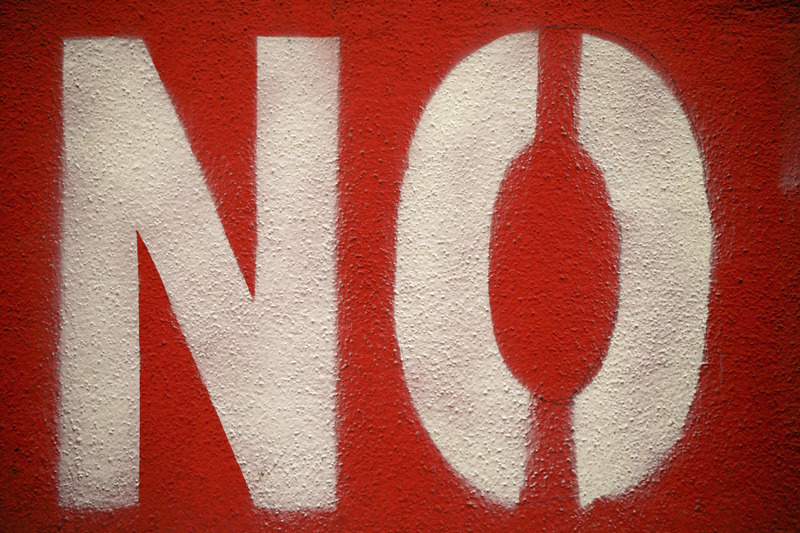 When your gut is telling you to say “no”, it’s probably the right answer. Whether it’s business or personal, you need to know your value. When presented with a choice, you need to evaluate why you are saying “yes” or “no”. If a friend needs a favor and you want to help them out, say yes. But, if you are saying “yes” because you feel you have to or you don’t want to disappoint, you need to re-evaluate your answer. When you’re saying “yes” for the wrong reasons, it’ll only lead you to feel resentful, burnt out or even hurt. You have every right to give the answer that makes you most comfortable and that you is right for you. While you want to be careful that you aren’t someone who says “yes” to everything, you also want to make sure you don’t become the person who is always saying “no”. It’s important to find a healthy balance that works for you. You should do things that push and challenge you, and that’s where saying “yes” is a good thing. While there are many benefits to saying “no” when the result is unhealthy for you, you don’t want to hold yourself back from a potential opportunity. It’s important to get in tune with yourself and understand what your motivations are, what your challenges are and what makes you happy. Read more blogs like this at, https://www.theauthenticceo.com/.